'World of Dance' The Cut competitors S-Rank. Photo by Justin Lubin/NBC. The anticipation of who would make it to the Divisional Finals continued to build as the Upper Team and Junior Divisions took the World of Dance stage to prove why they made it so far in the competition. Mentored by Janna Dewan and guest mentor Paula Abdul, the Upper Team Division was up first, and the pressure was on for each group as they fought to claim a spot in the top three. ‘World of Dance’ The Cut competitors Desi Hoppers. Photo by Justin Lubin/NBC. Desi Hoppers, who brought an Indian flair to hip hop, were the first to grace the stage. Their performance was full of culture and fun as they mixed old and new hip hop together. Apart from the amazing choreographic elements, Desi Hoppers also delivered a routine chock full of creative visuals and pictures that had the judges amazed. With a score of 90.7, Desi Hoppers claimed the first place spot. Embodiment was next to perform and didn’t hold back with their attempt to secure a place in the top three. Embodiment went with a more mellow choice of music juxtaposed with various hard-hitting and soft movements. It was fascinating to see how they made their own rhythms within the music that were not there. Their performance was graceful and full of surprise elements that brought it to life on stage, along with exceptional visuals. After impressing the judges as well as the audience with such a beautiful performance, Embodiment claimed the first place spot with a score of 91.0, knocking Desi Hoppers to second place. ‘World of Dance’ The Cut competitors Lock N Lol Crew. Photo by Justin Lubin/NBC. Next to take the World of Dance stage was Lock N Lol Crew. Known for their energy and innovative choreography, Lock N Lol brought fun to the stage in their performance. One highlight of their performance was the visuals that the crew made with their bodies. It was something different that had not been seen before. Along with infectious energy and fun that was complemented with the music choice, Lock N Lol secured the third place spot and hoped to hang on to it for the duration of The Cut. The Bradas were up next and brought a tribal feel to their performance. Their theme was well thought out, and they told a story from start to finish. The Bradas delivered a routine with synchronicity and great formations, as well as smooth transitions. Their energy and fight to claim a spot in the top three could not be denied, and with a score of 89, they knocked Lock N Lol out of the competition and claimed third place. ‘World of Dance’ The Cut competitors Connection. Photo by Justin Lubin/NBC. Connection hip hop crew stormed the stage next with a performance that they hoped would top all other performances. They hit the ground running with a routine full of contagious energy throughout. They served amazing isolations, as well as clean formations. Connection also added to their performance by mixing in the Latin flair that they are known for in a routine that embodied pride in their country. Overall, their routine was hard-hitting, and the energy from Connection continued to build from beginning to end. With a score of 91.3, Connection claimed first place, knocking The Bradas out of the competition and dropping Desi Hoppers to third. Next to take the stage was Poreotics. With the challenge to get to the dancing quicker from their last performance, Poreotics brought the house down with their performance. Their isolations were unbelievable, along with various popping and locking. Their visuals were fun and unusual, which added a whimsical feel to each movement. Poreotics’ music choices were creative and unexpected, and they delivered great musicality regardless of the genre. 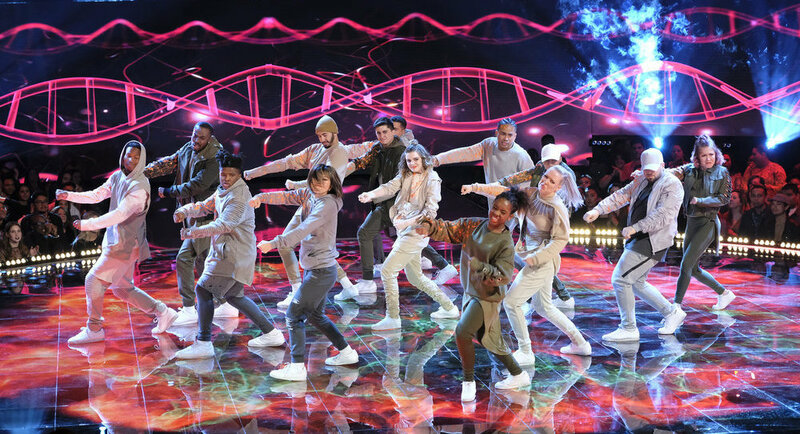 The judges were beyond amazed with their performance, and with a score of 91.7, Poreotics had a guaranteed spot in the Divisional Final round, which put Connection in third place and knocked Desi Hoppers out of the competition. ‘World of Dance’ The Cut competitors The Ruggeds. Photo by Justin Lubin/NBC. The Ruggeds were next to perform, and they came to the stage swinging in the fight to secure a top three spot. Their routine had great visuals, along with elements and tricks that had never been seen before on the World of Dance stage. The Ruggeds showed amazing strength, as well as athleticism that was out of this world. Their choreography was well thought out, and the synchronicity that they brought to their performance was undeniable. It was magic from beginning to end as they pushed the envelope with this performance. The Ruggeds claimed first place after scoring 92.7, knocking Poreotics to second place while claiming a spot in the top three. S-Rank, who brought fire to the stage throughout the competition, came with even more intensity for The Cut round. With a great concept in mind, S-Rank played out a seamless performance with great visuals. They brought even more magic to their performance with how they complimented their music choice with each movement, along with a rewind moment that was golden. They honestly gave justice to why the judges consider them to be the cleanest team in the competition. After scoring 92.3, S-Rank claimed second place, which knocked Connection out of the competition. 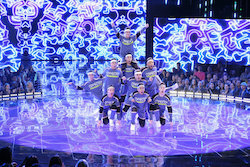 The top three groups of the Upper Division moving on to the Divisional Finals are Poreotics, S-Rank and The Ruggeds. ‘World of Dance’ The Cut competitors Josh and Taylor. Photo by Justin Lubin/NBC. The Junior Division was next to battle it out for the top three spots in their division. Ne-Yo served as their mentor, along with guest mentor Mel B. Josh and Taylor were first to take the stage in hopes of securing a spot in the last round of the competition. They had a storyline that they put in motion from the start. Josh and Taylor made a great use of the stage with various intricate moments sprinkled in throughout their performance. They delivered a fun performance with musicality that was off the charts. With a score of 85.3, Josh and Taylor automatically claimed first place, and the competition continued to pick up from there. Victoria Caban, who wowed the judges early on in the competition with her flair in the flamenco style, took the stage next with a routine that was just as spicy as her other performances. Victoria gave a passionate performance that showed through her facial expressions and straight down to her feet. With that same maturity that the judges loved from the beginning, she handled her routine with grace and brought pride to her heritage with her flamenco routine. Her performance overall was exceptional, even with a minor issue with her costume. Victoria was tied with Josh and Taylor for first place after scoring 85.3 as well. ‘World of Dance’ The Cut competitors Jonas and Ruby. Photo by Justin Lubin/NBC. Bringing a futuristic feel to the stage, Jonas and Ruby upped their game with a ballroom routine that was out of this world. Apart from some amazing tricks, their technique was unwavering as they moved from one element to the next. Jonas and Ruby made great use of the World of Dance stage and utilized a variety of ballroom styles with ease. 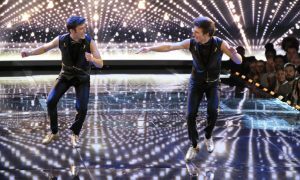 They were perfectly in sync with each other, and their performance overall was true entertainment. Jonas and Ruby claimed first place after scoring an 88.3, which tied Victoria and Josh and Taylor for second place. Madison Brown took the stage next with a performance that was not only mature in subject matter but in dance quality as well. She took her storyline to another level with a heartfelt performance that was not only beautiful but graceful. Her lines and facility were flawless, and her technique was undeniable as she went from one element to the next. With a score of 85.7, Madison claimed second place. ‘World of Dance’ The Cut competitors Sean and Kaycee. Photo by Justin Lubin/NBC. Sean and Kaycee were another dynamic duo to hit the stage with another great performance full of storytelling. 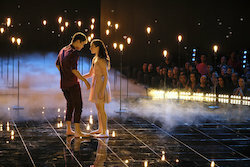 Portraying a story of love, Sean and Kaycee had great mixture of dance styles throughout their performance. Apart from great technique, there was an emotion and authenticity that they brought to the stage that was pure magic. There was an undeniable connection between Sean and Kaycee that brought their performance to life. Although a lot of their movements were subtle, the overall routine was executed beautifully. They claimed first place after a score of 92.0, which made for a double elimination of Victoria, Josh and Taylor. Ballet duo Avery and Marcus were up next on the World of Dance stage and brought a completely different feel to their style to make it unique. While keeping the classical ballet elements, Avery and Marcus mixed in great partnering elements with a bit of jazz to bring their vision to life. They had great technique throughout their performance. Although they were applauded for having a different concept by the judges, it didn’t quite fit the music, which was a slight disadvantage. After scoring 85.3, Avery and Marcus did not make it through to the Divisional Finals. ‘World of Dance’ The Cut competitors Charity and Andres. Photo by Justin Lubin/NBC. After getting the first perfect score of the competition in the last round, Charity and Andres were destined to keep the bar high with their performance in The Cut round. They delivered great partnering, as well as individual moments, which balanced out the overall routine. They had the same death-defying partnering tricks, along with flawless transitions. Charity and Andres delivered a performance that was effortless throughout. The strength from the both of them was phenomenal, and it showed as they scored a 92.7, which knocked Sean and Kaycee to second place. Jaxon Willard was the last performance of the night, and even though he started off shaky during rehearsal, that was all put to rest once he hit the stage. He brought a more edgy feel to his routine, which was completely different from his performances in The Qualifiers and The Duels rounds. Jaxon incorporated some hip hop within his contemporary style, and he brought fire to the stage. He hit hard with each movement he made and delivered some great acrobatic elements that made his performance pure entertainment. Jaxon’s performance was one of transformation that surprised the judges. With a score of 90.7, Jaxon claimed third place. For the Junior Division, Sean and Kaycee, Charity and Andres, and Jaxon Willard will move on. The Divisional Finals is up next for these talented dancers, and it will be a fight to the end. Tune in! You won’t want to miss it!